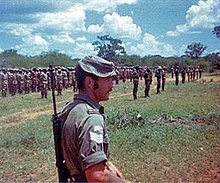 For Rhodesian Army counter-insurgency tactics, see Fireforce. Weapons fielded included TT pistols, PPSh-41 submachine guns, AK-47 & AKM assault rifles, SKS semi-automatic carbines, RPD and RPK light machine guns, as well as RPG-2 and RPG-7 rocket propelled grenade launchers and various Soviet grenades. 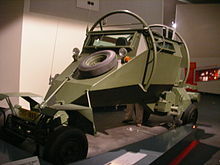 The Rhodesians only discovered how well equipped the nationalists had become when raids on guerrilla base areas towards the end of the war revealed mortars, 12.7mm and 14.5mm heavy machine guns and even heavier calibre weapons such as 122mm multiple rocket launchers. ^ Mtisi, Joseph; Nyakudya, Munyaradzi; Barnes, Teresa (2009). 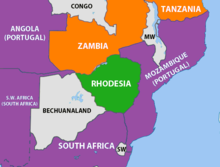 "War In Rhodesia, 1965–1980". In Raftapoulos, Brian; Mlambo, Alois (eds.). 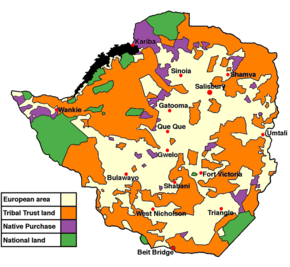 Becoming Zimbabwe: A History from the Pre-colonial Period to 2008. Johannesburg: Jacana Media. p. 158. ISBN 9781779220837. However, despite efforts at forging cordial relations, many missionaries were brutally murdered by guerrillas during the war. Missionaries in isolated rural schools and missions often found themselves in the worst possible position, caught between soldiers and guerrillas. Perhaps the most horrifying example was the ZANLA attack on Elim Mission, a Protestant outpost in the eastern Vumba area, in 1978. ... Eight adults, all dead, the bodies of their four children lying beside them; one a three-week-old girl. Dabengwa, Dumiso (1995). Bhebe, Ngwabi; Ranger, Terrence (eds.). 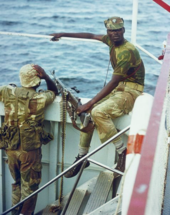 Soldiers in Zimbabwe's Liberation War. 1. Harare: University of Zimbabwe.